My Swift Orientation in Sumner, WA. A lesson well learned. I just hope it helps others to speak up. Just because we are new to this, ESPECIALLY because we are new at this, we need people that are serious about teaching us how to do this job safely and properly. I was out 11 days and was allowed to touch the Qualcom twice. That isn't right. But again I didn't say anything so it is my fault.It will not happen again. It may cost me a few days but I want to make sure where I stand with hours accredited to me before I go out with a new mentor so I know where I stand. OK all here it is. On my last day of orientation I left with my Mentor. It started out good for the first 50 miles. He drove over the pass because of the snow and told me that I would be driving after that. Because of the weather he didn't want me to drive to our first destination, then the next. on our 3rd day in the snow he ran out of his 11hr clock as we hit the interstate, which was bare and wet, he changed over to my clock and I was getting excited but he kept driving. Now at this time I should've got off the truck as fast as I could but I wanted so bad for this to work so I kept my mouth shut. By day 3 I had 3.75hrs of driving then he wanted to take time off with his friend in Vegas. Well I won't get into a day by day list about what happened but to get to the bullet points, in the 11 days I was on his truck the qualcom shows me driving 53hrs of which he drove 16-20 of those. Of the last 10hrs that I did drive he spent 7-8 of them in the sleeper watching movies instead of sitting next to me answering my questions or giving me tips on how to drive as is required for my first 50hrs of driving. He talked and text on his phone while driving (of which I have video) and he refused to use an ashtray, flipping his ash and lit butts out the window (I also have video of this) even through we were in AZ, NM, TX where it's dry as can be. Then he started telling me that my trainers at the academy misinformed me on how to shift and other things and when I told him that I was trained differently than how he wanted me to drive he told me "You can argue with me, but it'll be a very short argument, you can do it as I say or get the hell off my truck." So off I got. I'm now in a hotel room waiting for another mentor, who will hopefully be a lot better. Now this is not a slam against Swift in any way. In most any company you will find some people who will not follow the rules and as far as I can tell Swift is going to take care of me and the situation so I have no complaints there and would still recommend Swift to anyone wanting to get into the industry. The moral of the story is, if you find yourself in a similar situation speak up at the first sign that something isn't going right, that's what your driver leader is there for. If I had done so then I could've saved myself a lot of stress and time. 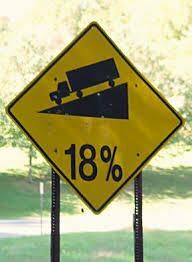 Remember this is an important part of the base that your career is built upon, DO NOT cheat yourself out of the training experience that you deserve and need to be a safe and professional driver. OK day one was a lot of paperwork and online paperwork. We had 5 videos, a Swift welcome video, Whistler blower video, Driver qualification video, Driver wellness video (eat right, exercise, get enough sleep) Bendix stability control systems video. Next was the wiz quiz, that was sitting for 45 minutes just to pee in a cup. Afterwards I spent 45 minutes filling out DOT forms online. Last of all, we watched a video on US Legal Services. Witch I'm on the fence about but leaning towards. I also was introduced to my Mentor, and I was given a shock of how hard I will be going. As soon as I am done with orientation on Thursday we are leaving and heading East. I will drive, take my 10 off then drive again, take my 10 off and repeat. We'll see how I hold up. I personalty think that the company is testing me. Chris told me that he is suspended until Thursday. Then he takes me on. BS? I don't know, He may be screwing with me but I'm willing to learn along the way. I arrived at the hotel this afternoon at about 1:30. I'm just under 6 miles North of the terminal in Sumner. The shuttle bus will pick us up at 6:30 tomorrow morning to take us down to the terminal for a 7:00 start. I'm a little nervous but mainly excited, a couple of my classmates from the Academy came through here last week so I have an idea of what to expect. I have no roommate yet but I'm sure one will show up before to long. I'll keep everyone posted on how it goes tomorrow. My shifting instructor had what he called a tickle, a tap and a slap. 200, 400,and 600 rpm. how he taught me to down shift was 1) brake to 800 rpm 2) clutch in as you pull it out of gear clutch out 3) slap the throttle by that I mean hit the throttle so you hear it slap the floorboard and let off immediately 4) clutch in while shifting into gear, clutch out. My driving instructor helped my refine my shifting by having me shift from 2nd up through 8th then back down through to 2nd over and over and over and over again. I must have done that for 6 to 8 miles down the road and it helped me 1000%. I just graduated from the Swift Driving Academy on Friday. There was a student in my class who had got his CDL 15 yrs ago but he never had any driving experience in an 18 wheeler. To work for Swift they required him to go through training. My Swift Driving Academy experience. Day 17. Final day Woo Hoo! After roll call Brandon and I went across the river to Clarkston, WA to the DMV and got our official CDL licences. I am now a professional truck driver and have the licence to prove it. The rest of the day was long and time seemed to crawl along. I went over my pre-trip inspection 5 or 6 times then just sat in a truck until it was time to leave. I came back to the hotel and packed my bags. I have my bus ticket home and leave tomorrow morning at 6:00. If anyone who reads this is looking into getting into the truck driving industry and lives in Oregon, Idaho, or Washington, I would very much recommend coming to the Swift Driving Academy in Lewiston, ID. Yes it is fast paced, but the instructors know their jobs and are VERY good at them. 3 weeks ago I had sat in the passenger seat of an 18 wheeler twice in my life. Today I am confident that I can drive one safely. Do I have more to learn? Of course, I haven't even scratched the surface of what I will learn, but the instructors have given me a solid base to build upon, and I want to thank each and every one of them for what they have done for me. This will be my last post on this thread. If you have any questions for me please PM me and I will answer. I will start a new thread when I start orientation. Day 16. The day started with roll call and 1/2 of pre-trip. Then at 7:00 I was called into the office to talk to the state tester. Nervous didn't even cover it. PRE-TRIP; I started with the Exhaust, and from there I went around to the engine on the passenger side then the driver's side. Next was the from the Tires, in through the Brakes to the Suspension. Checked the Doors and the Emergency equipment then moved on to the rear of the tractor, Frame, Drive tandems, and 5th wheel set-up. Next was the Trailer, then the In cab. All of which I passed with only 3 points docked from me. Skills tests; Straight backing, Off-set backing, 90 degree backing, Nailed them all! Driving test; Started off great, no gear grinding or anything. Then I thought things went to crap. I got nervous and thought that I was missing things and that only made things worse for me mentally. About a quarter of the way into my test I was told to do an Emergency stop. Once I had explained the procedure, I had decided to let it go as it will and to drive as I was taught. Went pretty well until I came to a stale green light in 6th gear that changed on me and I downshifted to 5th and came to a stop. I pulled it down into 2nd but I forgot to do one thing. (how many are laughing at me now?) for those who don't know there is a switch that changes the transmission from low to high range. I didn't flip that switch down, and stalled the truck right there. When we finally returned he asked me how I thought I had done. I told him I thought that as long as he didn't fail me for stalling I had passed but just barely. Turns out that he was grading that intersection so stalling cost me a point but wasn't an auto-fail. I was dinged 9 points total so I had passed with a 97%. Out of 300 points I could miss 30 and still pass. 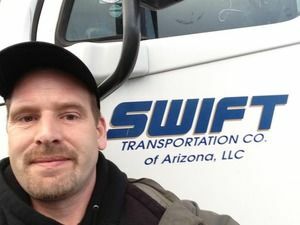 So long story short, I was given my Commercial Driver School Certification, and will be attending Swift orientation in Sumner, WA on 2-4-14. Day 15. After pre-tripping the road truck We set out at 6:30 this morning with me behind the wheel. Right from the start It went wrong. I couldn't shift, remember to check my mirrors, couldn't even remember to stop far enough back to see the stop lines at intersections. I thought that my Swift company driving test was going to be an absolute disaster. After the other 2 in the truck got a chance to drive we came back to the Academy and took a break. At 10:00 Scott came out and asked me if I was ready, what was I going to say? No? So off we go and it started off well good shifts, stops, nice tracking down the road. As we entered town I missed a downshift coming up to a turn, turns out I wasn't required to shift to 3rd to go around every corner. So I started to get nervous. To combat the nervousness I figured that I'd try commentary driving. The problem with this is that it ended up distracting me, I started forgetting to check both of my mirrors during my turns and that cost me points. I ended up losing 11 points but passing with 89%. After lunch I spent 45 minutes practicing both the 90 degree and off-set backing in preparation for tomorrow. I nailed them both 4 times straight right from the start so I jumped out and walked away before I screwed myself up on them. I spent the rest of the day practicing my pre-trip. Tomorrow is the day that is going to really count. The State tester is coming in to test me. Pre-trip, straight line backing, off-set backing, 90 degree backing, and road driving tests. All in 2 1/2 - 3 hours. I'm going to get a good night's sleep, have a good breakfast, and give it my best tomorrow. I found out the same thing, not just with shifting but with the 90 degree backing as well. I was getting frustrated then something just clicked in my head and it made sense. Good luck and keep us posted. Day 14. The day started out with pre-tripping the road truck. Then away we went with James at the wheel. At 9:30 it was my turn to drive. I did pretty good this morning, only a couple of things I need to work on. After 1 1/2 hours we took a lunch break. At 12:45 it was my turn again, for the next 2 hours I was put through my paces. I was told that tomorrow I will be doing the Swift driving test and on Thursday I will be taking the State tests. I just have to remember to start down shifting a little earlier and calling out my mirror checks and I'll be fine. I did a lot of in town driving today and about 30 miles out on the highway. I really enjoyed the highway driving and am looking forward to the day I'll be getting paid to do it. But first things first, I'll concentrate on tomorrow then on Thursday and then we'll see what the future has in store. Day 13. Today was the first day of road training. I have Scott as a driving instructor now instead of Rick. We left the terminal at 6:30, I was the first of the 3 of us to drive. My shifting this morning was a little slow so Scott had me shift from 2nd gear to 8th gear back down to 2nd then up to 8th over and over and over again, needless to say I now have no problem shifting. After almost 2 hours it was time for the other guys to drive. We came back to the Academy at 11:00 for lunch then it was back to it. I drove for 2 more hours with no major problems, I just need to work on my recovery gears but I'll get it. Tomorrow we get to start commentary driving, that will be an interesting experience. For those who don't know, I have been recording my experiences at the Swift Driving Academy in Lewiston Idaho. It is in the Training Diaries section . If you are interested in Swift Transportation and in Washington, Idaho, or Oregon then this is where you'd go. Day 11. Started the day with 2 hours of Pre-trip study. It was cold again this morning but we had fog as well. Then I was put on the 90 degree backing range for an hour, no cone suicides today. After break I went out driving with Bill, a new instructor for me, for a little over an hour. He is very laid back, he allowed me to do my thing and told me how to correct my mistakes which were only minor this morning. It was a pretty cool drive. After lunch I got to get on the offset backing range for 1 1/2 hours. I had no problems with it at all. At 1:00 Rick took my roommate and myself out driving. I got to go first. That was a fun, somewhat stressful, and at times really scary 1 1/2 hours. After driving through town he took us to a small lake to take a break. When we left there he told me to turn left on one road and I knew where we were headed, right for an 18% downgrade. As we approached I asked Rick what gear we should be in and he told me to take it in what I thought was appropriate so I put it 5th gear and started down. As I went down the first part I realized that the hill was getting steeper and steeper and my eyes got bigger and bigger. About this time Rick casually says "I would have put it in one gear lower." Now I'm thinking that I'm in for a hell of a ride. Rick tells me that I can down shift but if I decide to do it then I can't hesitate and to make the shift quickly. So I hold the brakes and get the RPMs down to 600. I managed to get it down shifted but in that 1 1/2 seconds from when I first put in the clutch to when I released it in 4th gear I had a real sick feeling that it was going to end really bad, but all turned out well and I got a big confidence boost. About 20 minutes later as I was following Rick's directions we were approaching the airport and he told me to turn right. He said that this is a fun road. Now, I've learned that when Rick says something like that it's time to get ready for a challenge, and I wasn't disappointed. It turned out to be an extremely narrow, twisted, hilly road. I most definitely had my hands full just steering and keeping the trailer tandems on the pavement but you throw in the shifting, oncoming traffic, and trying to keep my speed up and I was almost frantic. I managed to keep my cool and afterwards found that I enjoyed it and now I'm looking forward to whatever Rick has in mind for me next. When we got back to the Academy we had a class on shifting and emergency procedures as well as commentary driving, which we start on Monday. We finished up the day with more pre-trip study. Tomorrow is a classroom day. Day 10. Started off with Pre-trip as usual but it was 26 degrees out and my feet were frozen. Once we got the trucks warmed up everyone decided to study the in cab portion of the pre-trip. I practiced the 90 degree backing for 2 1/2 hours, got it every time but one. Damn cone jumped out and dove under my trailer tire. Three of us went out driving with Rick in the afternoon and took turns driving. I did much better on my shifting today there's still room for improvement but I'm getting better. We were told that we won't be driving tomorrow so that they can concentrate their efforts on the other students. So I don't get to drive until monday. Until then I plan on studying my commentary driving form so I know what to do come Monday. Finished out the day with a few minutes on the off-set backing course and helping one of the first week guys learn the pre-trip inspection. On a sad note we lost one person from our class today. He was really struggling and decided that this wasn't for him. I have to giving him credit for trying, nothing ventured in life nothing gained. Day 9. Today started with, wouldn't you know, pre-trip practice, 2 1/2 hours of it. Then Rick, my driving instructor, grabbed me and put me in the truck to practice shifting. Well it just wasn't shifting on the roads around the academy, oh no, we got out onto the highway and took a trip to town. Over bridges, one of which really had me sweating it was so tight, through stop lights, stop signs, residential neighborhoods, school zones, left turns, right turns up hills, and down hills, and all the while I'm trying to remember what gear I'm in, how fast I'm going, what my shift points are, how to shift, and a hundred other things. Needless to say, I was stressed. Here I must stop and say that Rick was very patient with me. He kept trying to get me to laugh and relax. He would explain to me what I did wrong and how to correct the problems, even when I tried to up-shift from 4th gear to 3rd gear, funny how that doesn't work all to well. Anyway Rick is a great instructor, I've already learned a lot from him and will continue to. After we returned I got to practice the 90 degree backing for almost 3 hours, I've got the hang of that now and can do it 9 times out of 10. The other 10% of the time I turn to soon or to late or the cones just decide to commit suicide and jump under my tires. At 1:00 Rick and I went back out on the road for 1 1/2 hours. This time out things went smoother for me but I'm still trying to down-shift without getting my RPMs down first and every now and then I start a turn to soon and my trailer tandems end up on the curb. Rick had me drive down a narrow, twisting road that would be a lot of fun on a motorcycle but the designers had definitely not thought about semi trucks with 53 foot trailers when they built it. I made it through but it was tight. Finished out the day with more per-trip study. 9 days down, 8 to go, onward and upward. 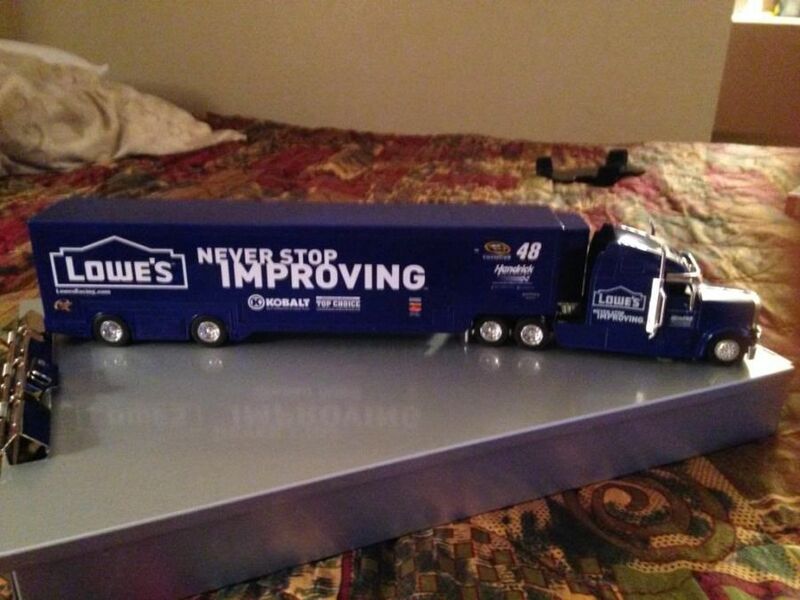 I'll keep the wheels rollin'. Day 8. Today started with 2 hrs of pre-trip, surprise. I felt pretty comfortable with it this morning. I'm able to go through large sections of it with only a couple of stops to make sure I didn't forget any parts. Next I spent an hour practicing the Oregon-Idaho 90 degree backing, they had me hook up one of the Volvos to it and let me tell you, those trucks steer so much better than the Freightliners. Well I've got the 90 licked, I can hit it 90% of the time now. After our first brake the fun started. I was taken out on the road and taught how to shift. I picked up the up shifting pretty quick but the down shifting is a little more involved, Clutch in gear out clutch out, tap throttle just hard enough, clutch in gear in clutch out, It seems pretty straight forward to me as I write it out but it took a little while for my feet hand and brain to agree on the sequence of these things but I got it. The instructor, Rick, seemed pretty impresses with how fast I picked it up. Impressed enough to throw in a couple of other exercises, I was told to drive with my tandems 1 foot off the curb along a line in the road and after a few tries I was able to stay there for the most part. I was only out for a little over an hour but I'll get more time at it tomorrow. After lunch I was told that I was going to take a practice pre-trip test, so I went through the whole pre-trip only missing a few things. When I was finished the instructor and I went over how I did and what I missed and he asked me if I felt comfortable enough with it to take the Swift pre-trip test. I told him tat since I know what I needed to do to get it right that I would be up to doing it. He then spun his clipboard around and said sign here and congratulations you passed with a 97% score. Next it was onto the offset backing test. I went back a little to far and was docked 2 points but that just proves I'm human. When I was finished with the offset test I got onto the Washington 90 degree backing course for the first time. After a couple of tries I was able to get it in easily. 45 minutes later an instructor came over and tested me on the 90 degree backing and I nailed it. We finished off the day with more pre-trip studying. So, over all today I passed 3 Swift company tests, and got out on the road for the first time. It was a great day. Today was good but really tiring. We started with 2 hrs of per-trip, I'm starting to find my rhythm and getting a flow going from one part to the next without so many stops to check myself . Started backing on the offset for a short time then was moved over to the straight line backing for 1 1/2 hrs, got the hang of that one. Then was put on the 90 degree backing for 4 hrs and I finally figured it out, something just clicked and it dawned on me how to do it. I'm not all to efficient at it yet, I hit it right about 50% of the time, but I know what I did wrong right after I did it and sometimes as I'm doing it . I'll get it with practice so I'm now worried. After driving we were shown how to slide the trailer tandems and the 5th wheel. Then finished up the day with more pre-trip study. 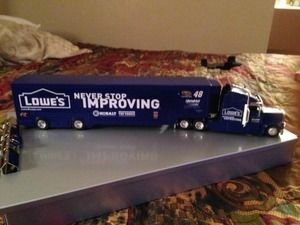 I'll do more pre-trip study tonight, I'm going to make sure that by the time I take the state test I can spit it out without having to think about it. I chose Swift because I wanted to train with a large company. One that hauls different kinds of freight and has opportunities to get into a dedicated route Swift also has comfort zones that they will try to keep you in and I would like to stay in the west, well not so much as to stay in the west but more as to stay out of the northeast. Also I couldn't get the recruiters from Prime, Knight, or FFE to call me back.